Hello all! Well this is a departure from home improvement, but while I was pregnant I became obsessed with shopping for and learning about cloth diapers. Once I realized how much money I could save, and my Mom informed me she'd cloth diapered ME- I was hooked. The Hubsbeast took a bit more convincing, but some comparison charts and YouTube videos helped to bring him over to the light side. What took some HARD convincing was the "process" cloth involves. I quote: "I am not putting TWO diapers on him every time! "...what he meant by that was when I showed him prefolds/fitteds and covers he was not impressed. Having to learn to fold them, pin them, and cover them was not something he was interested in doing. He was good with cloth- but he wanted them to be as disposable like as possible. Fine. That's why AIO and AI2s were designed! I did my research and came up with three systems I liked and could see working for us: Rumparooz One-Size Pockets, Grovia Hybrids, and BumGenius 4.0s. One-size. I wanted them to fit from the time his cord stump falls off till he's ready to toilet train. Not to many parts. Each of these systems has 3 bits to them, max. A cover, a soaker/stuffer, and a booster. Economy. I wanted to be able to buy an entire system that would do us at least a day in the early days until we figure out how many we go through daily. This meant the discount given for buying a "stash" was factored in. I wanted to pick a system and stick with it- not have to sit for hours matching up which inserts and boosters went with which diapers. Ease of Use. I wanted to be able to show Hubs/ my mom/ MIL/ babysitter/ whomever how to use the darn things ONCE and not have them be incredibly overwhelmed. Once I came down to these three I handed it over to Hubs and told him to pick. He asked me about the different systems and why I liked each one, did his own research, and decided the Grovias. From what I can gather he liked the colours & prints, the price for the initial system, and that for the most part that there's only two pieces. We chose to go with snaps because everything we read said that eventually the velcro/aplix/ hook and loop wears out- and we hope to use these for this baby and the next one. So we ordered the Grovia Live package which includes 12 shells, 24 soakers, and 4 boosters. The company I bought mine from (One Posh Baby) allowed me to mix and match colours for the shells and get half and half organic cotton soakers and stay dry soakers, and we chose stay dry boosters. So I ordered them and they came to about two weeks later (there was a slight delay because apparently the Cloud colour is in HIGH DEMAND.) After unboxing them all I put the shells into their basket by the changing station since those don't require prepping. The soakers and boosters require 5-6 washes though according to the Grovia website. I've done a lot of research on cloth diaper safe detergents/ prepping/ stripping diapers. Basically what I've learned is that residue = repelling = bad. So anything that may leave a residue on your diapers is a no-no. I decided to initially wash my soakers and boosters in a combo of Synthrapol and Soda Ash. This is a combo that's used by people who are prepping fabrics to be dyed using Procion dyes- and it's meant to remove oils, grease, and waxes that may be present on fabrics from manufacturing that would interfere with dye taking evenly. Since this is basically what I want to happen with the diapers (though just to be clear- NOT dyeing my diapers!) I figured this would be a good initial wash procedure. *Note: this is not a Grovia-approved method of prepping. I take no responsibility for any harm that may come to your diapers as a result of following my method, even though no harm came to mine. * So I dumped the lot of them in with 3 tbs of Syntrapol and 2 tbs of Soda Ash and set it to a hot wash, cold rinse, medium sized load on a low soil setting. (I don't have the option to do a hot rinse on my machine unfortunately.) Out they came looking good and into the dryer on low heat for as long as it would let me. My dryer has a "sensor dry" setting only for low heat drying, which seems to get the soakers MOSTLY dry. They're still a bit damp afterwards. So they have to go through twice and/or I have to put them on a timed high-heat dry. For those interested I used the Jacquard Product's Synthrapol and Soda Ash. After that first wash I switched to BerryPlus Liquid Laundry Soap. I stumbled across this at my local baby supply store, and the fact that it only had 5 ingredients really caught my eye. Also the SMALL package. It claimed to do a whole load with only 3 ml of detergent (for a top loader- which I have. Only 2 ml for a front loader!) I did some quick research on my iPhone while I shopped and discovered it's a Canadian product (score!) and cloth diaper safe. It uses soap nut concentrate and a few other things to get stuff clean, and doesn't have a scent after drying. So I bought a 40 load bottle. Soakers and boosters go in, three squirts out of the bottle, hot wash and off we go. I find when I open my machine there's an almost cinnamon-y smell- but not when I actually take a good wiff of the contents. It's just a hint in the general direction of the washer. After drying everything there is NO SMELL. It's amazing. I tested it out on a full load of heavily soiled week-old dirty laundry too and same results. So unless we have issues I think we're sticking with this stuff- I like that when we travel to my parent's house I can bring his detergent that he's familiar with with us (or when we go on our family vacation to Florida in February) and not have to scramble to find cloth safe detergent where ever we are. I also love that they're a Canadian company- and after following them on Facebook I discovered they're advocates for individuals with special needs- which you probably already know is incredibly important to me. So awesome eco-friendly Canadian product who use their voice to support a cause near to my heart? Yeah, they're getting my repeat business. Since I've discovered them it's all I've used on both LittleBeast's and my clothing AND his diapers- and my intial 40 load bottle lasted me just under two months. Love this stuff! Part 2 will be about how we use our diapers on a daily basis. Oh roll vinyl. Why they continue to sell this crap I haven't the foggiest idea, but this house was the worst roll vinyl offender ever. First, the stairs. The upstairs bathroom has the same stuff- but it's in fair enough shape that we decided not to mess with it at the moment. So now that the stairs are redone and the bathroom has new baseboards the biggest mess is our kitchen and front entrance. TL; DR: TrafficMaster Ceramica is the BOMB. This, admittedly, isn't all THAT bad in the grand scheme of things. 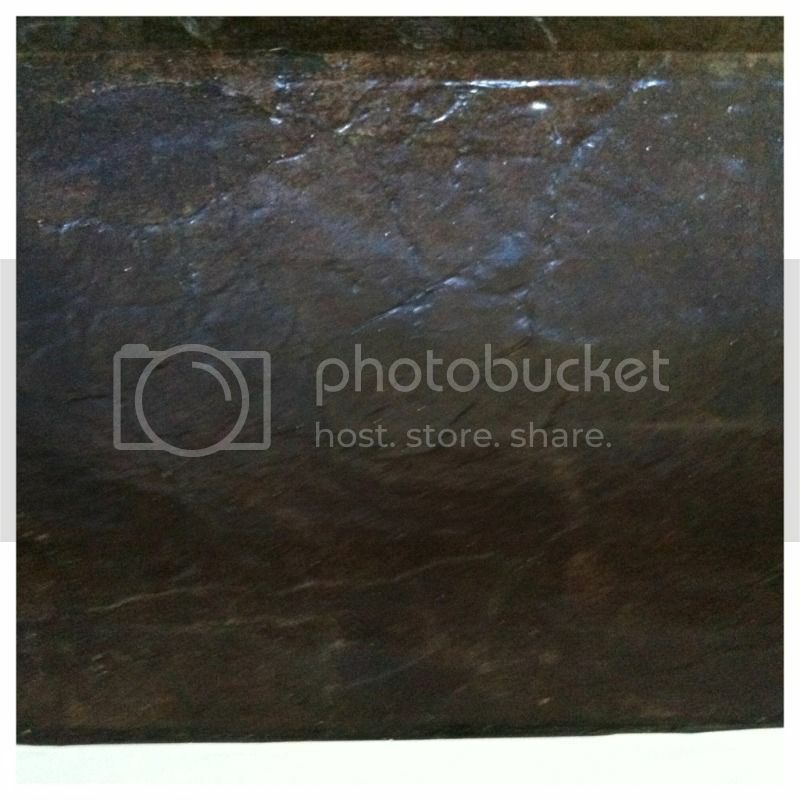 The issue here is mainly that it IS roll vinyl, and that it's 12 years old. And yellow. It doesn't look that yellow in that picture, but believe me- it is. The pattern was also way to busy- even if those were tiles, tiles that small have one spot: the bathroom. The sheen had worn off it (cause of course nobody ever waxed it) and it generally just looked dingy. And if something is NEVER going to look clean, I have a hard time motivating myself to clean it. The same vinyl is in the kitchen/ back entrance/ pantry/ half bathroom- but in MUCH worse shape. Hubs and I have hemmed and hawed over what to do about this floor for the last year. I've had several contractors come in and give me quotes on tile installation- and even with relatively cheap porcelain or ceramic we were looking at about four grand to have both this little front space and the kitchen space redone. OUCH. I know that doesn't sound like a ton- but for the market we're in, it is. I looked into poured concrete- and that was even worse. 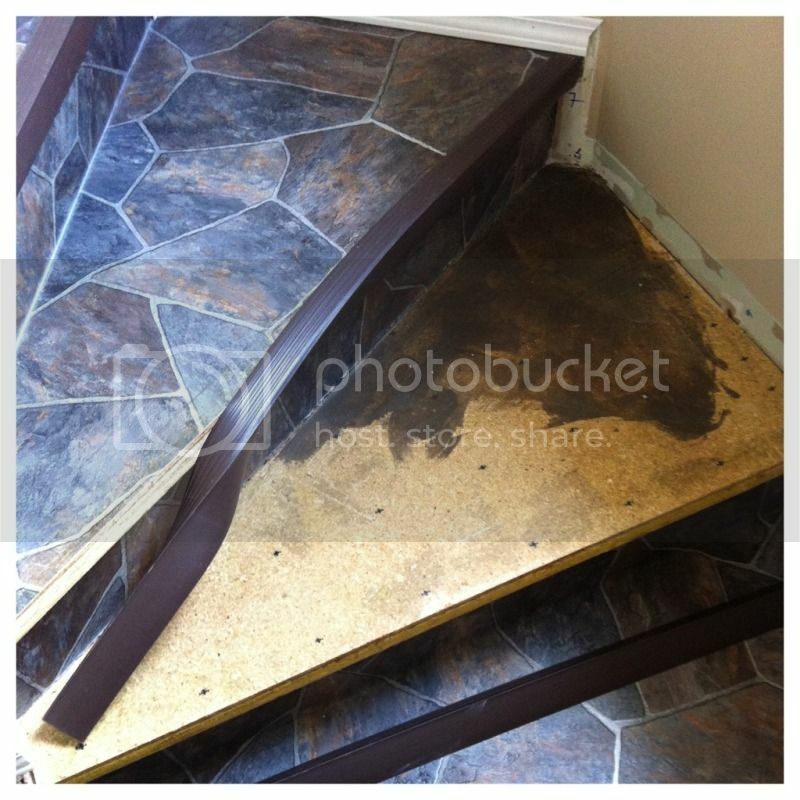 After consulting with our realtor, she agreed that putting that kind of money into the floor was unlikely to get us a return on our investment, although she also agreed that something really needed to be done about the ugly floor. In the event that we got unexpectedly posted out of here (always a possibility) our house really couldn't afford to be "awesome, except for that old flooring..." Remember the point of this house has always been to improve it's aesthetics, receive a big return on our investment, and be able to buy our dream house at our next posting. Could we attempt the ceramic installation ourselves? Possibly, but we weren't confident enough in our abilities to make the tricky cuts. And to get half decent tile it was still going to be close to two grand. More roll vinyl was not an option. So long story short, around Christmas Hubs was in Home Depot and stumbled upon a display for TrafficMaster Ceramica resilient vinyl tile. 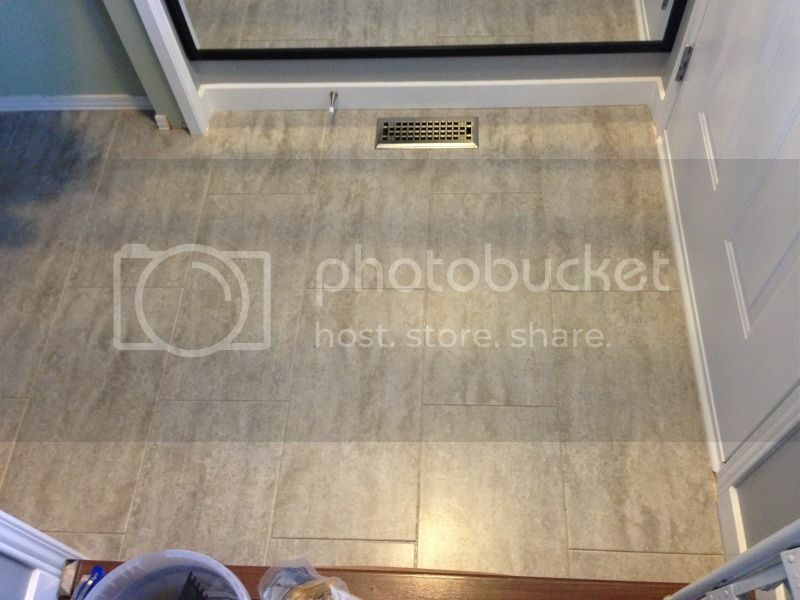 Yes, that's just a fancy name for peel and stick vinyl tiles. But this stuff had something the others don't: it's groutable. That's right. Peel, stick, GROUT, and all done. 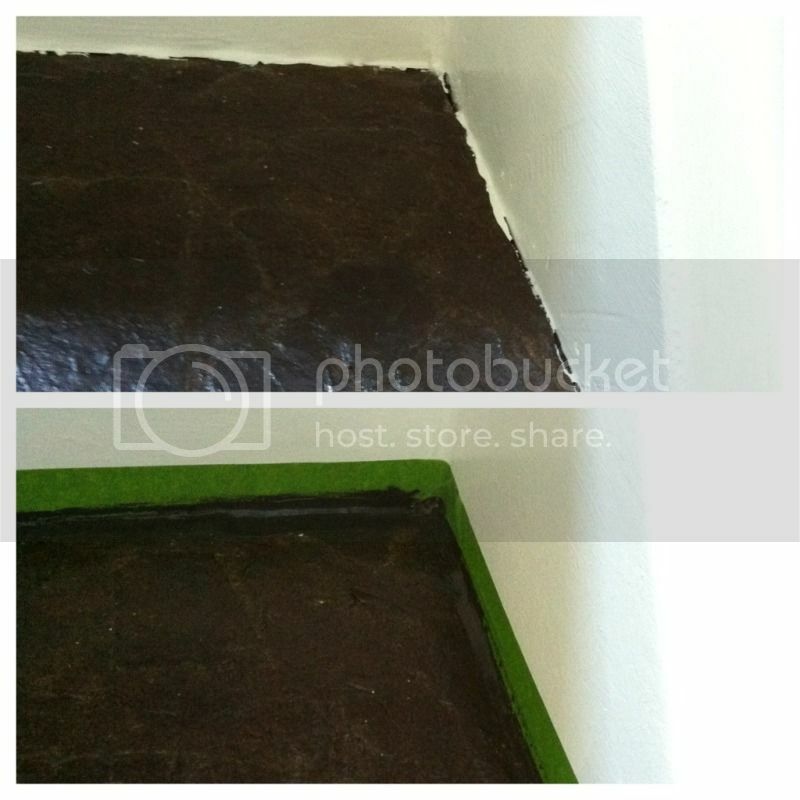 He spent some time feeling the samples in the store, and then came home and made his pitch: It looks like ceramic tile when installed with grout. 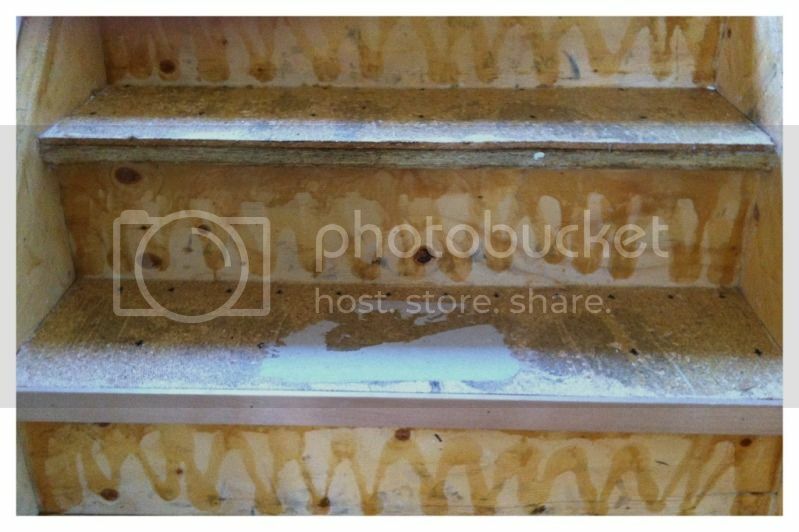 Even if you FEEL it it's hard to say it's not ceramic because it has actual grout lines, not printed ones. It comes in a bunch of different colours. It's able to be installed without a tile saw- just cut with scissors and utility knives. No mastic. I went with my Mom the next day to look and sure enough- this looked like the answer to our dilemma. It's also CHEAP. 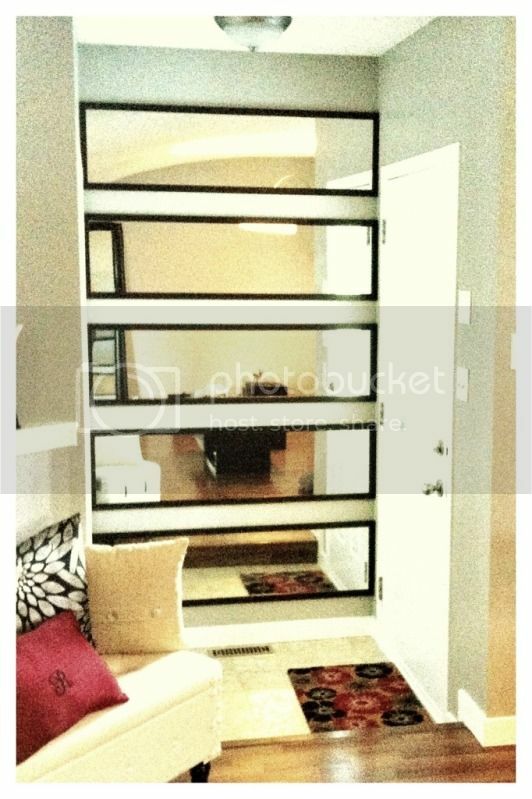 Like- it'd only cost us 600$ to do the whole kitchen and front cheap. So that was our new plan: peel and stick vinyl. When I got my tax return this past year we went straight to Home Depot (which is the exclusive retailer of this stuff) and looked at colours. We decided to order the "Natural Concrete" colour (it was between this and the "Dark concrete"...but with our kitchen we thought the lighter would be better.) 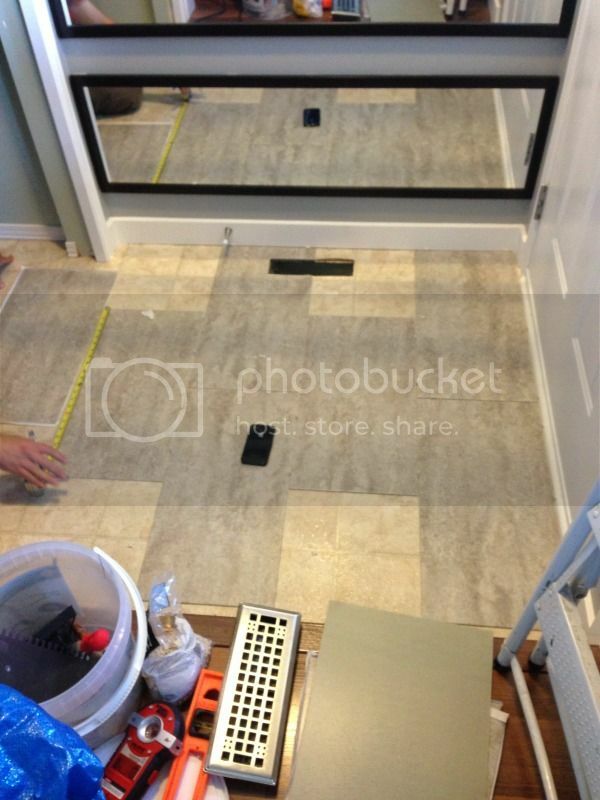 We chose 12x24 tiles with the intention of doing an offset brick pattern. It took six weeks to arrive. So back to the front entrance. This was Hub's baby. He sat and measured out the space and laid it all out. He washed the floor, sanded it with high grit sandpaper (just to rough it up and make sure the sheen was REALLY off that gross old lino) and he washed it again. Yes, this stuff can be installed right over top of the old lino! Then once it was all dry the moment of truth came- and he began to peel and stick. Peel and stick. Peel and stick. Measure, peel, and stick. There were some interesting cuts in there around the door frame (which he did with his trusty utility knife and some kitchen scissors), but for the most part all he had to do to cut them was to score and snap. So every once and a while throw a measure, score, snap, peel and stick in there. We made the executive decision to not remove the baseboards in this area because we'd just installed them last summer (with my Mom!) 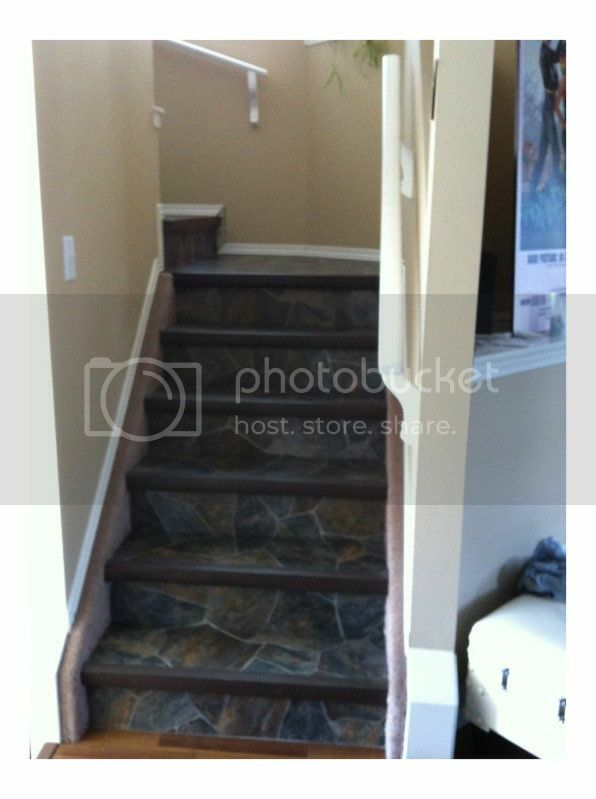 and there is a tricky area around the step into the living room that didn't look like it was going to come out easily. Instead we used a spacer and put a grout line around the trim and figured since we're using white grout it wouldn't be a big deal. Here's what it looked like once it was all laid, but before we grouted. Big improvement right?! 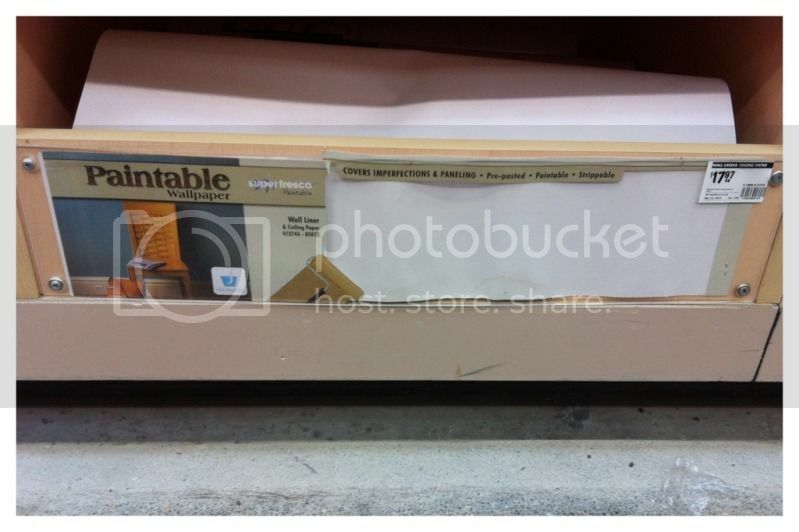 The back of the box suggests using TrafficMaster Stain Proof grout, but it's not kept in stock at Home Depot in Canada. We could order it, but we felt that was unnecessary when there was a whole aisle of grout sitting two feet away. After weighing the options we settled on Fusion Pro grout in Bright White. Fusion Pro is like the best of both worlds- it's premixed and has the working time of cement grout, but the stain, mould, and mildew resistance of epoxy grout- no part A&B to mix with only 90 mins of working time though! We felt it was the best option because it's low maintenance- no need to seal it and reseal it every two years. 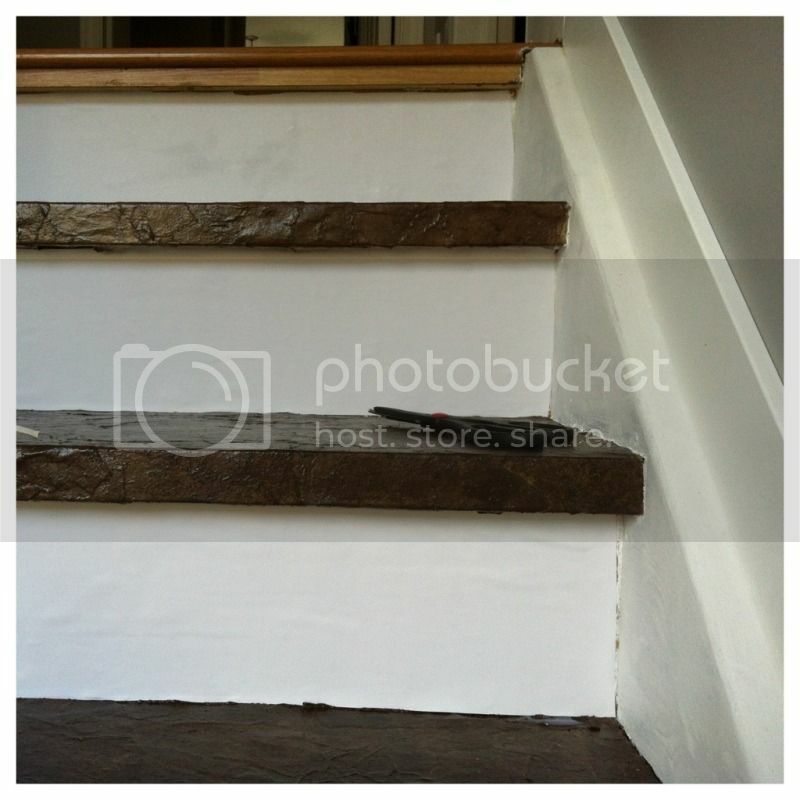 And in an entry way and kitchen with white grout you'd have to stay on top of the sealing or else risk lots of staining! It is a bit pricey- about twice the price of normal premixed SimpleGrout...but once we factored in the cost of the sealant and the fact that we'd have that cost (and have to remember to do it) until we sold the house, that cost quickly evaporated. Fusion Pro it was! And here it is grouted with the closet doors back on! Doesn't it look fantastic? 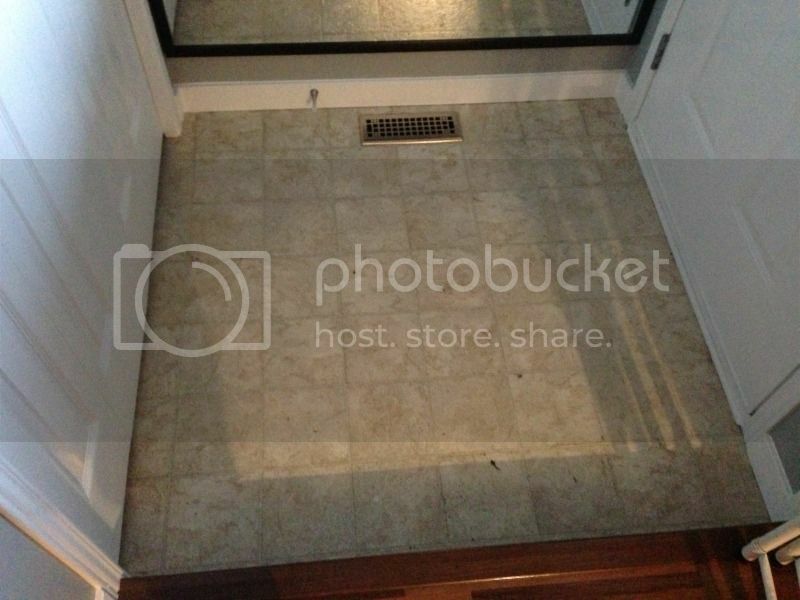 It looks just like normal tile- but it cost SO MUCH LESS. And the installation took only a few hours- Hubs started at 9:30am and was done four hours later with everything cleaned up and the doors back on! And he was kind of feeling this out since it was his first time- I know the kitchen will go faster seeing as he's got the hang of it. I am so thrilled with it. I can't believe this morning it was ugly yellowed lino full of pock marks! I can't wait for the kitchen to get started since that's where the real mess is. As big a change as this is, it's going to be tenfold in the kitchen. If you've made it to the end of this post- congratulations! You deserve a medal. 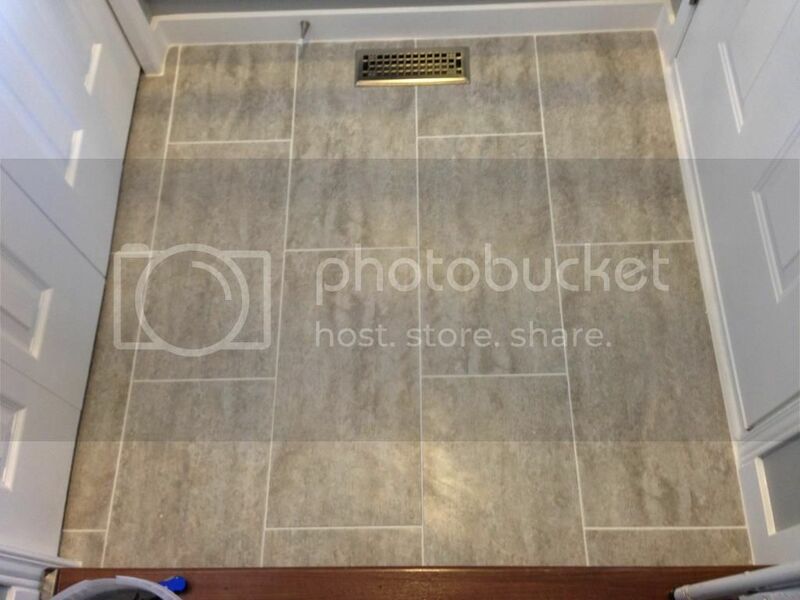 Are you considering using groutable vinyl tile for your floor project? I'd love to hear about it! I'll make sure to update you all with the kitchen progress once we get that under way! Hello! I know I haven't posted in about a year- but it's been a BUSY year! Since last August we've painted the kitchen and cabinets (still waiting on our new floor), painted our guest room, painted our nursery (that's right- I'm seven months pregnant! ), and finally FINALLY redoing the main bathroom. I'll get to everything else soon- I promise- but today I want to talk about my new bathroom. So- our house has only one full bath. 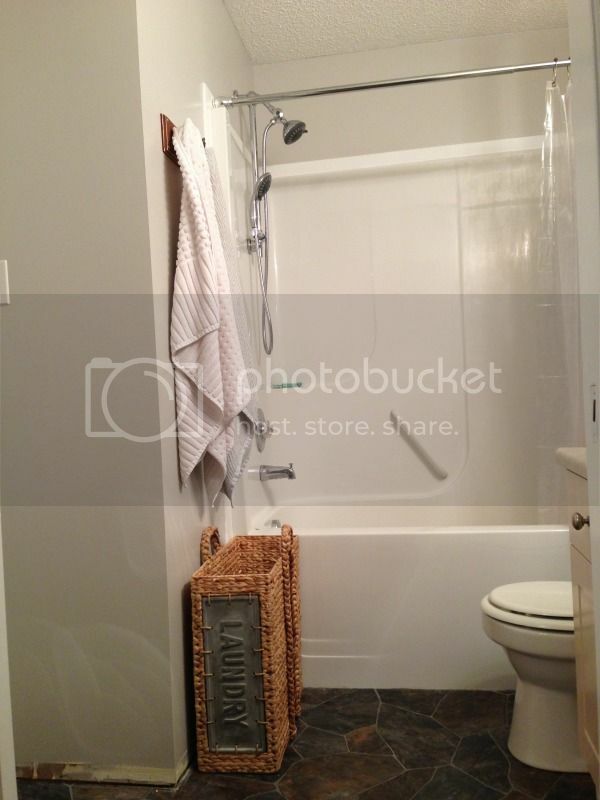 There's a powder room on the main floor (thank god) but we've only got the one shower/tub. Because Hubsbeast tends to wake up with the birds, showers at night, and doesn't want to disturb me (bless him)- he tends to use the powder room for his man-grooming and the full bath has become "my" bathroom. 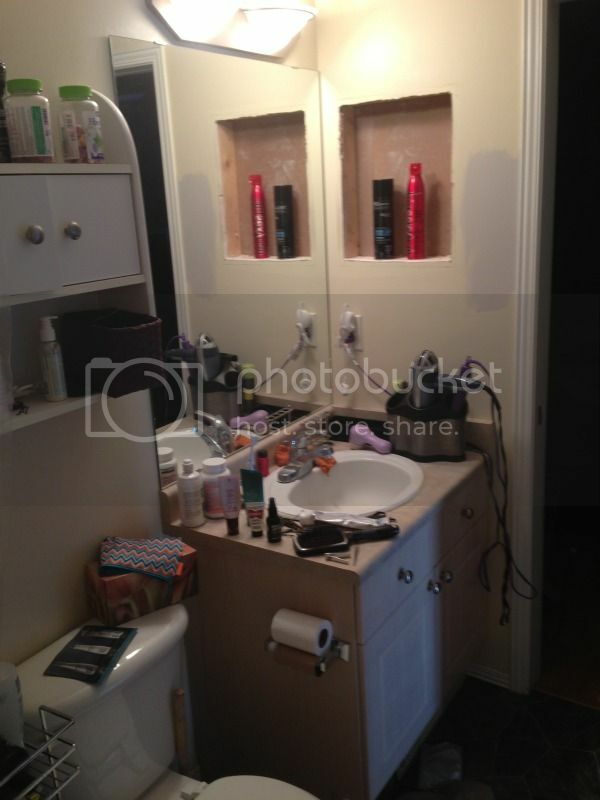 What "my" bathroom looked like on a regular basis. 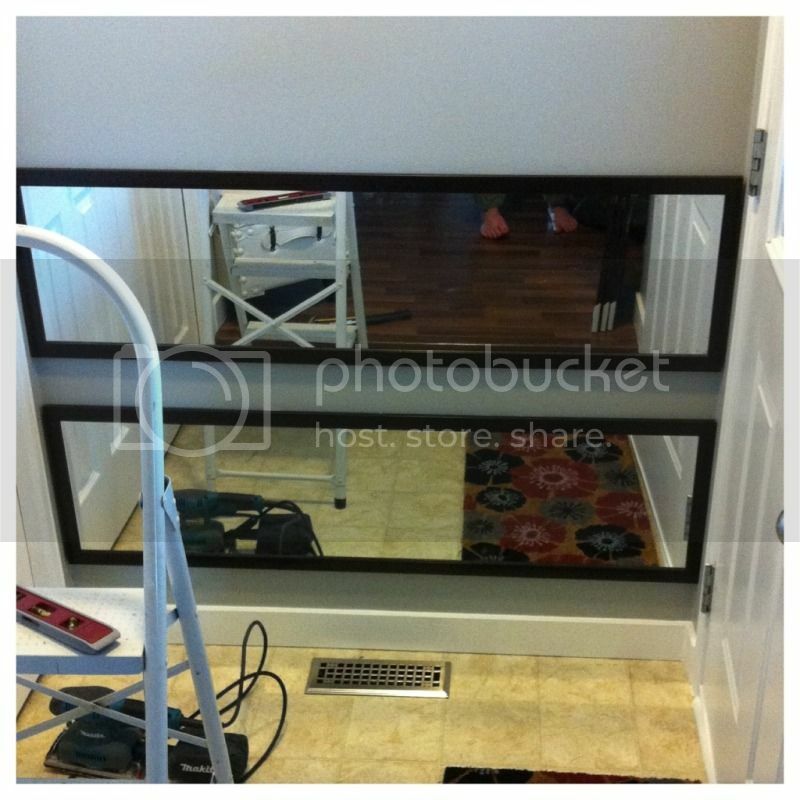 So in that first photo you see the vanity. 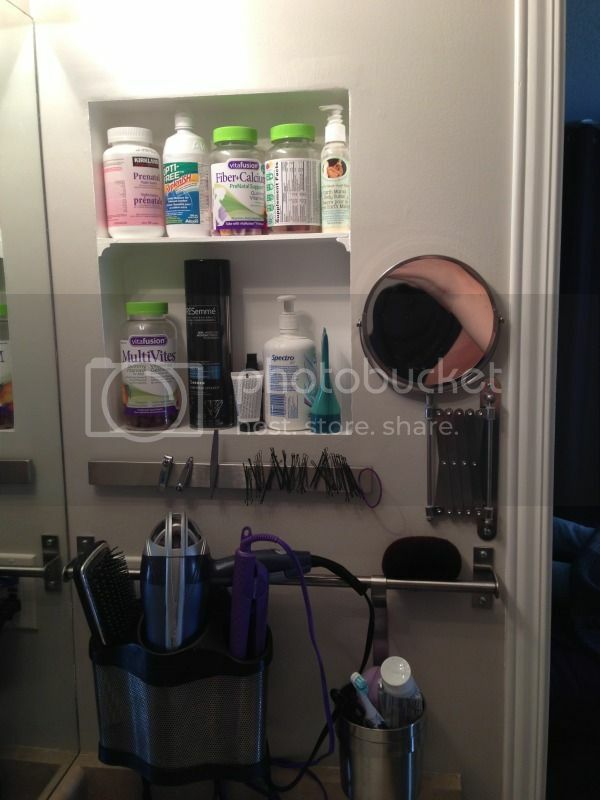 That hole in the wall holding my hair products used to be a recessed medicine cabinet which was the ugliest, most useless cabinet ever known to man. I didn't even take a picture of it before I tore it out of the wall. 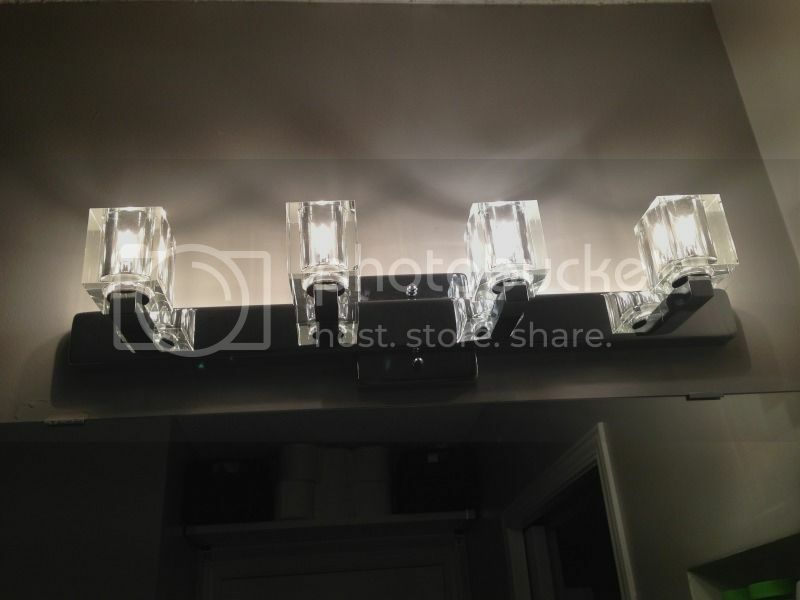 It was mirrored, which was annoying being perpendicular to the big mirror. It also had fixed moulded shelves which fit absolutely nothing of substance. In fact, when I went to pull it out- a year after we moved into the house- there was absolutely nothing in it. That's how useless it was. 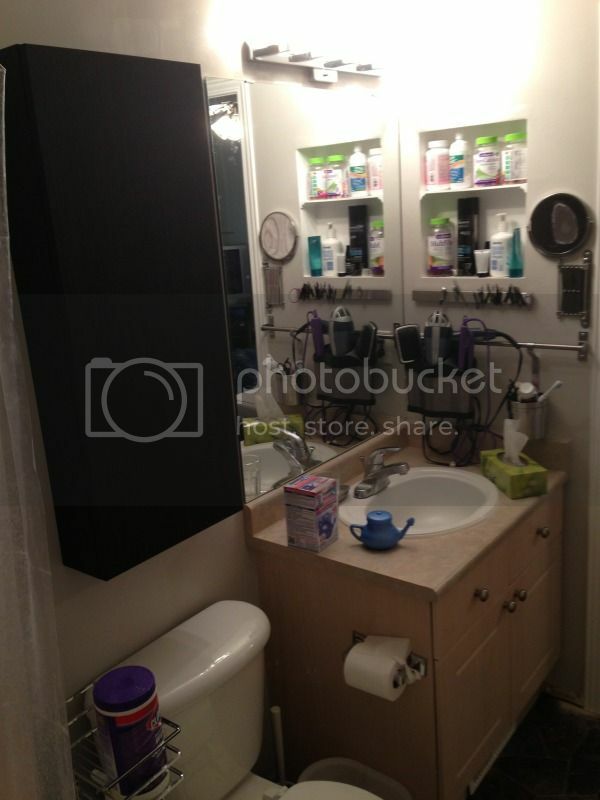 And if you look at the counter top clearly I was hurting for accessible storage. 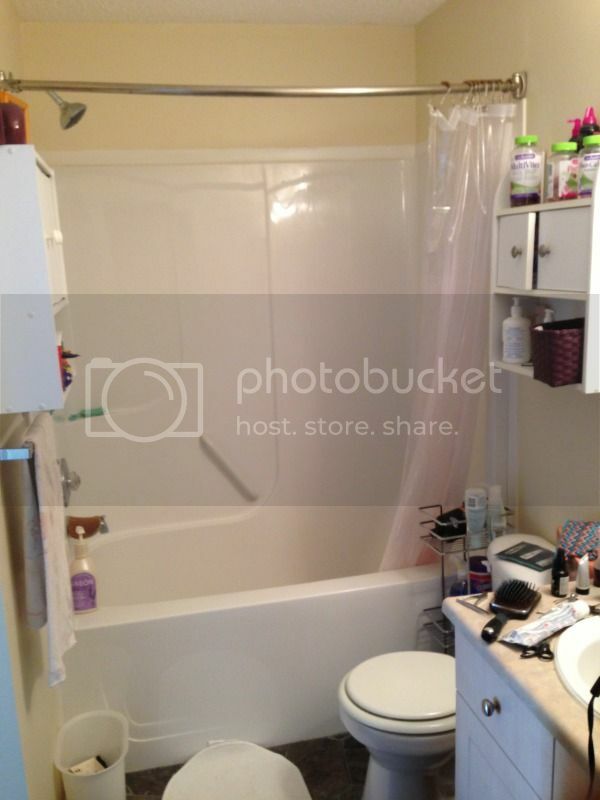 In the second photo you see our toilet/bathtub situation. 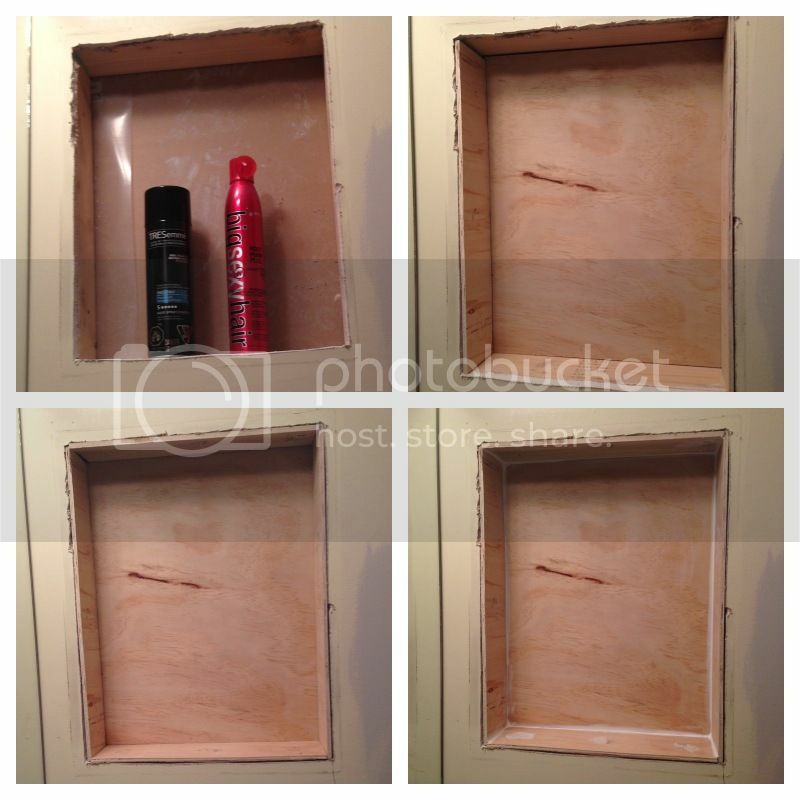 Our bathroom is a very tight L shape- and those two itty bitty cabinets that were on the wall made the walls come in on either side of you and made it feel even tighter. And again, they didn't fit anything!! 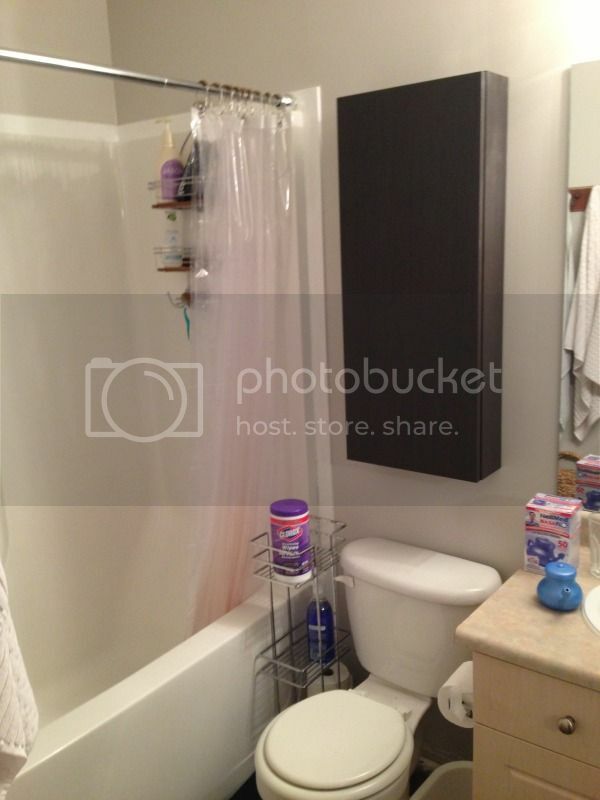 There was nowhere to hang our towels but that little towel bar squeezed in under the cabinet on the left. 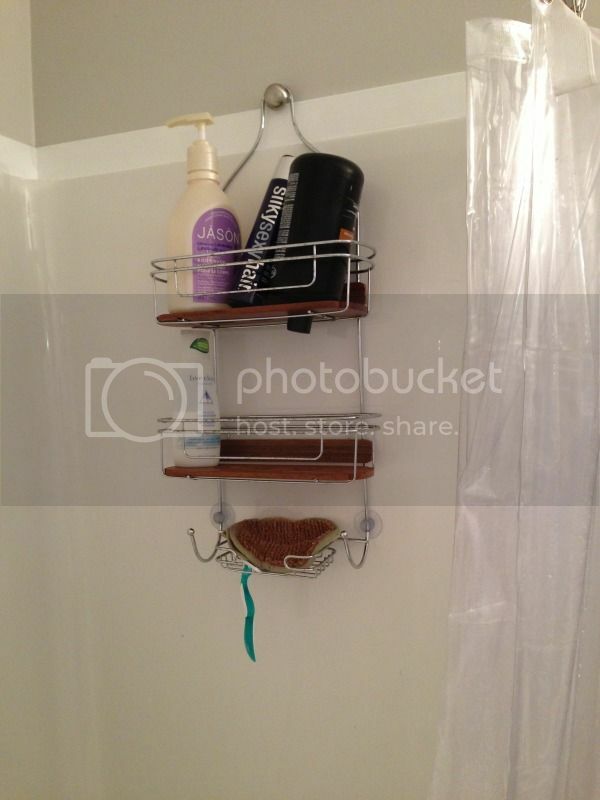 The tub also had no built in storage- meaning all my products ended up lined up on the edge there. Yes, it's a double entry. 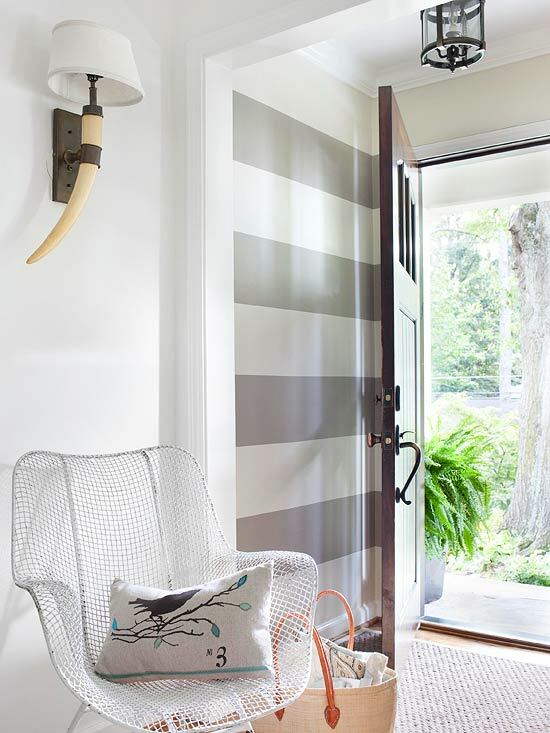 The pocket door goes to our master, and the normal door goes to the upstairs hallway. 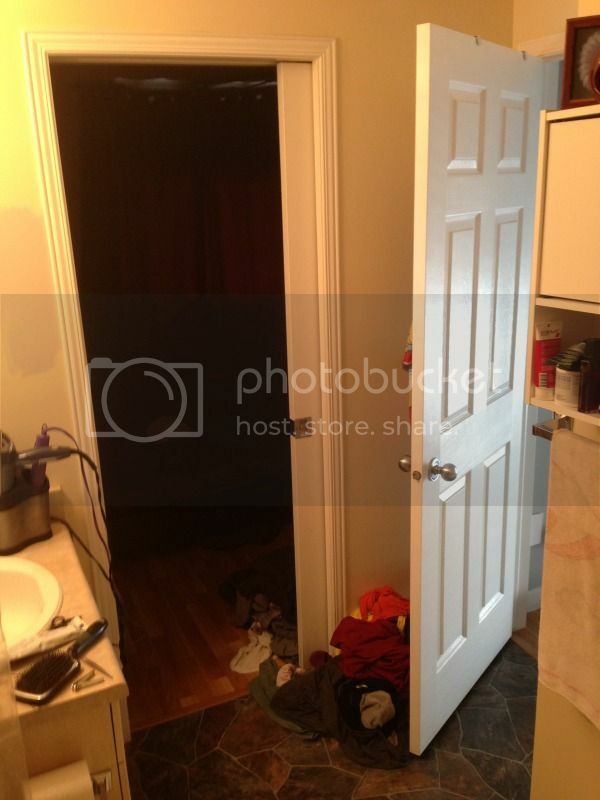 Yes, please don't judge- but that is a pile of dirty laundry behind the door. It always ended up there because I would roll out of bed and into the bathroom to shower and...I'm to lazy to walk back into my bathroom to strip. That's really the long and the short of it. As you can kind of see we had an over-the-door hook thing sitting on the door to try and give us a bit more space but it never really sit straight and would impede the door from fully closing. 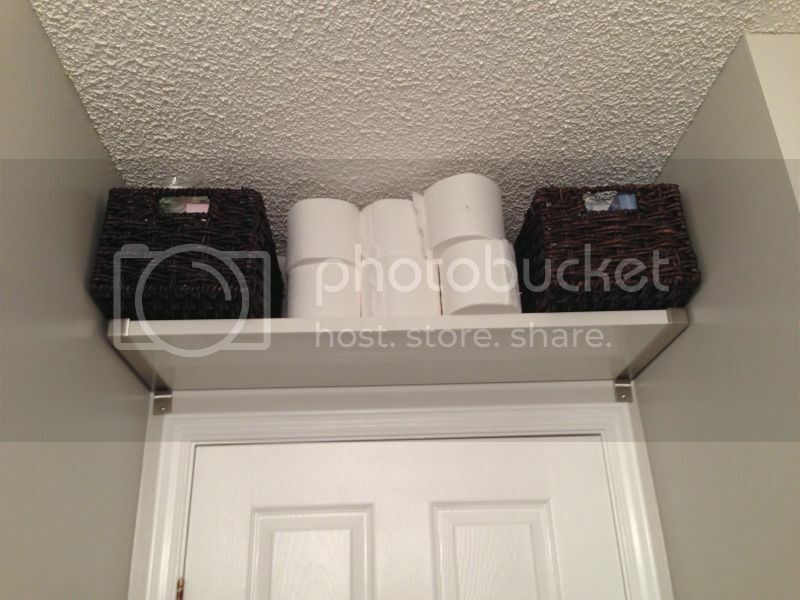 Now, beyond the storage and space issues in this bathroom there was the physical condition of it. Flat. Paint. 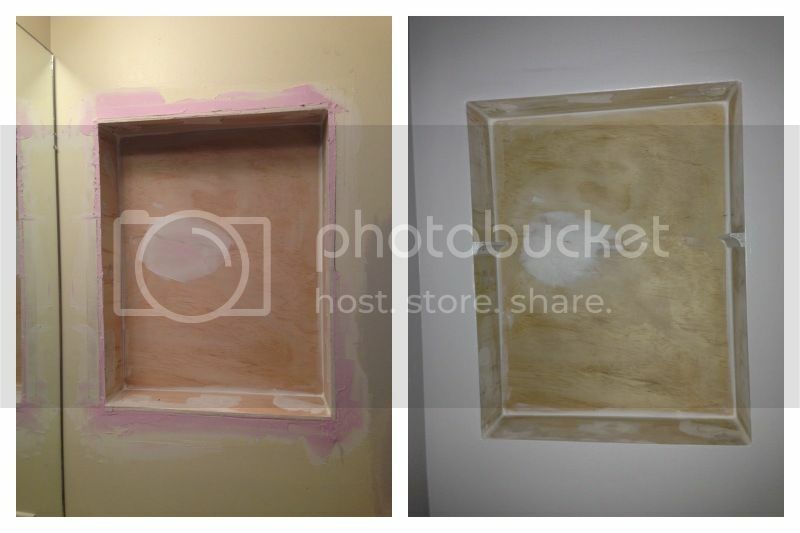 Who paints a bathroom with flat paint?! 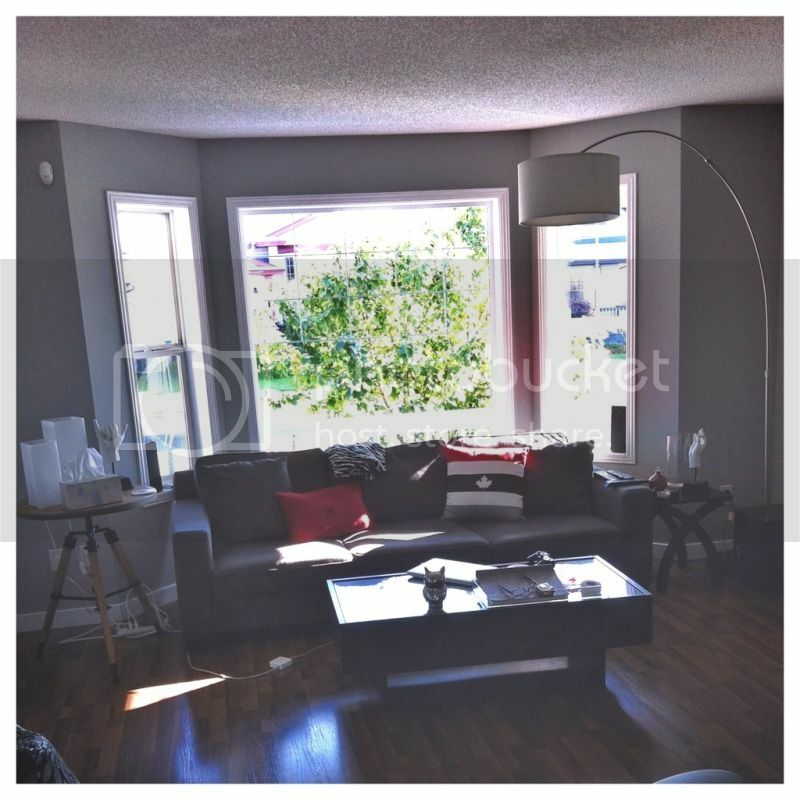 Apparently the developer of this house, because it was abundantly clear that this room- like every other room in the house- hadn't been painted 12 years. And I'm starting to realize after painting every door in this house that they were hung with possibly one thin coat of flat paint, if that. So yellowed, so scared, so ugly. So that's what I was working with- and after living with it for a year I was completely over it. I knew if I left it till after my baby boy shows up in two months it would never get done, and it would only get more cluttered once we introduced baby paraphernalia. 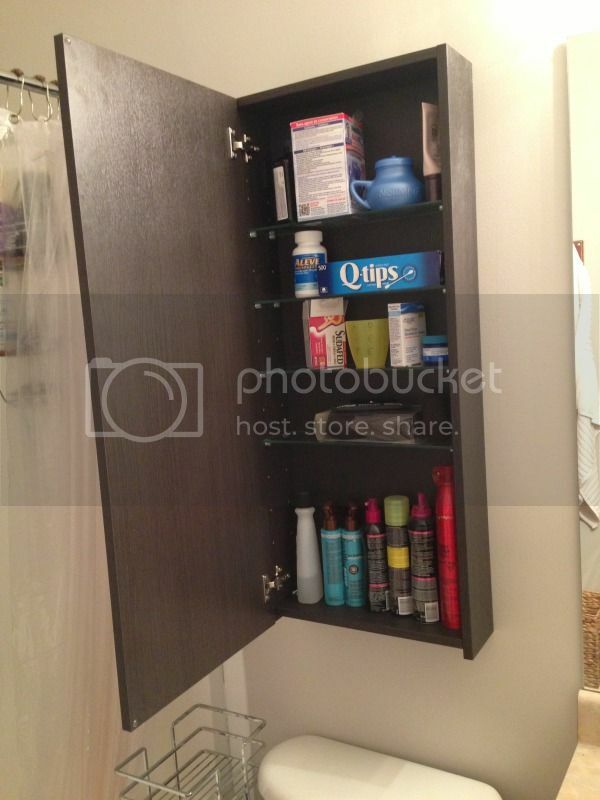 First things first- I pulled out that recessed cabinet in a flurry of pregnancy hormones and frustration one day. It was only being held in by four screws and once out I was happy to see it had been properly framed. The hole was rough, but after consulting with my Mom I had a plan of attack. I measured the dimensions of the back and the sides and marched off to Lowes in search of nice plywood I could get cut down. I found a 7$ sheet that all my cuts would fit on and a very helpful Lowes employee cut the boards to my dimensions. It should be noted that the Lowes board cutter is not for super specific cuts- but I wasn't worried about it being off by 1/4 of an inch because it was all going to be getting painted out the same white as the trim so I could compensate for imperfect cuts with my old friend paintable caulk. Since all that was along the back of the recess was drywall I couldn't put nails through the back and just glued it in with No More Nails. The sides were done with both No More Nails and finishing nails to keep them tight. Once everything was in I caulked the heck out of it! Since I ensured the sides were level with the drywall all I had to do was backfill the gap between the boards and the drywall with drywall compound- which took three coats, sanded in between. Once it was smooth and you couldn't tell there'd ever been a gap there I painted the WHOLE BATHROOM. But I'll talk more about that in my next post. As you can see I used cove moulding to make the supports for my shelf, again held in with No More Nails and finishing nails to ensure the shelf could hold some good weight. I very scientifically chose the height of the shelf by placing my can of hairspray in the recess and using Hubs' laser level to determine where it needed to rest. The whole point of this recess was to get the products I use every day up off the counter- so it was imperative that I could fit all my stuff without having to fight with it or it'd end up right back on the counter. Cause I'll admit it- I'm LAZY. And this is what that wall looks like now! The inside of the recess is painted out the same white as the trim- crisp and clean. I've installed a magnetic strip below it to hold bobby pins and tweezers and such. 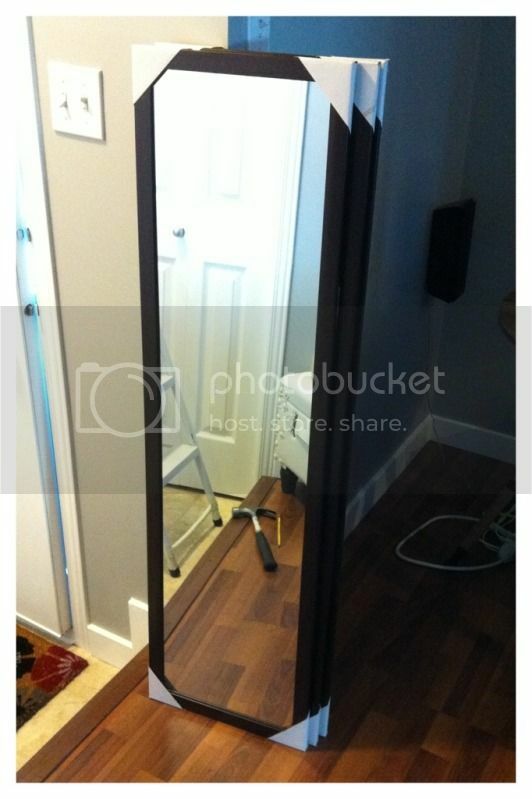 An extendable makeup mirror from Ikea fits between the doorway and the shelves- which gets my old makeup mirror out of the lower cabinet. The bar below is from Ikea, as is the little cup hanging off it- which holds my Clarisonic brush, toothbrush, and toothpaste. My hairdryer caddy is also currently hanging off the bar but I'll show you soon what we're doing so that it can live in the cabinet below, corral the cords, and I can add another Ikea cup or two for *gasp* my husband's and baby's supplies! Which means that this wall went from being useless, and my counter being so cluttered you couldn't even see it- to holding absolutely everything that was clogging the countertop in an organized and accessible manner. It's the ultimate in a place for everything and everything in it's place! I can't tell you how much better I feel not starting my day walking into all that clutter. And wait till you see how much more storage I added, and it still feels bigger than it did before! I promise not to leave you hanging again! For 200$ ish. 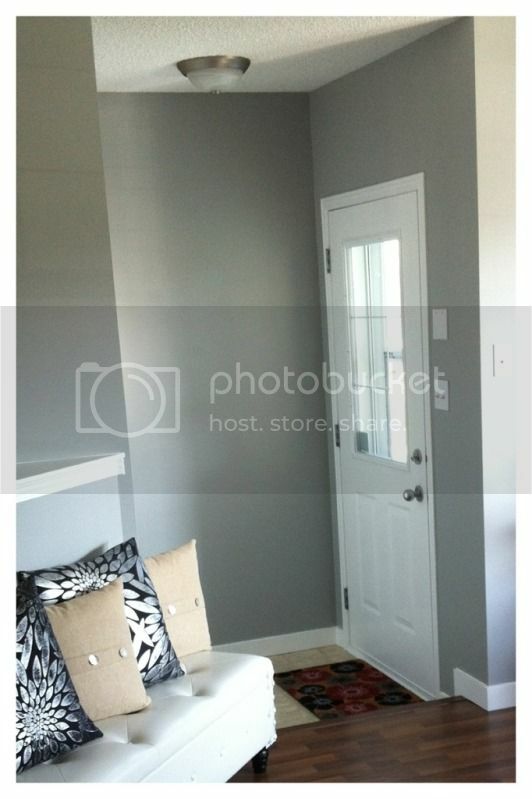 Minus the baseboards- but I'd say that probably only added about 20$ to the total materials bill. So- first things first. 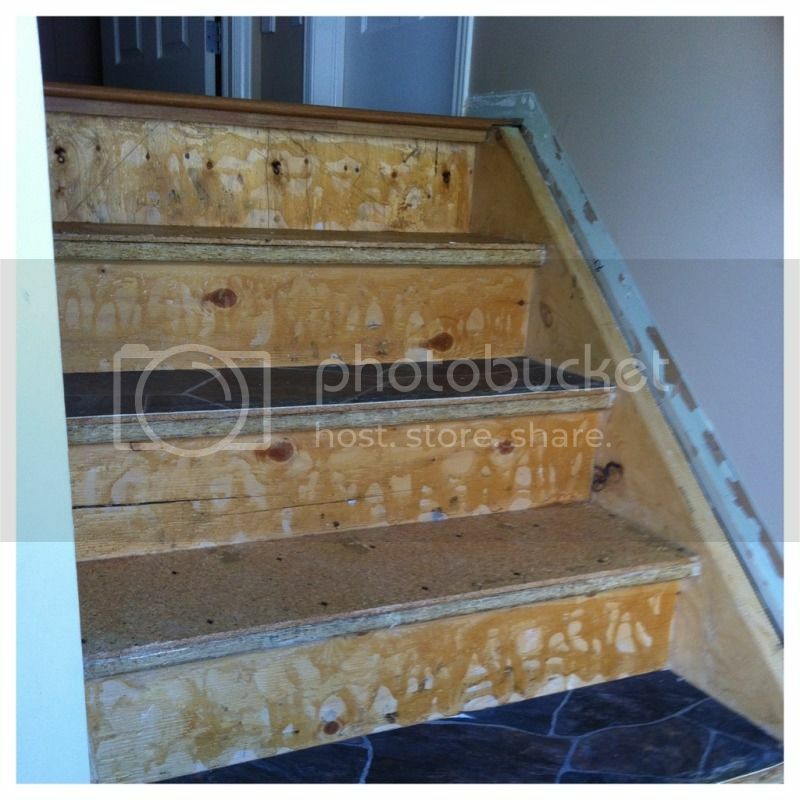 As you can see in those horrific "before" photos, the stairs were covered in lino on the risers and treads, and the stringers were covered in carpet. Gross. 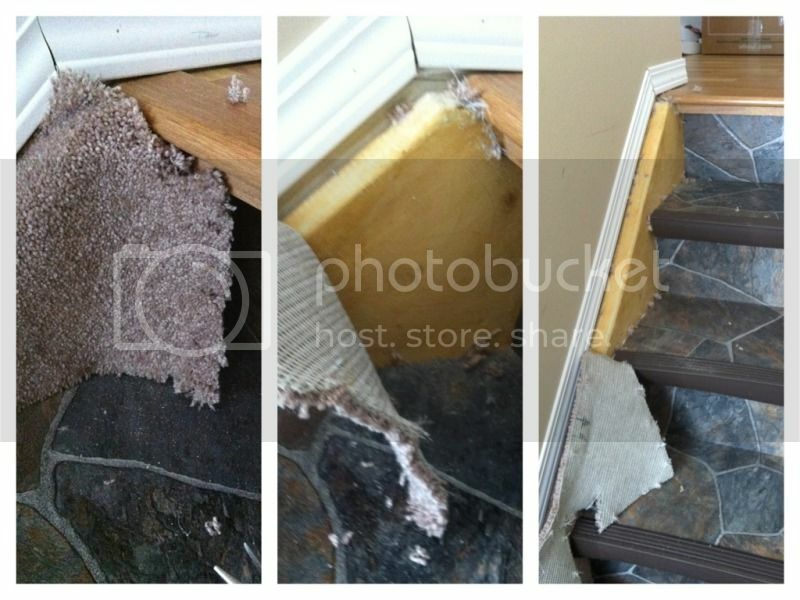 So the first order of business was to tear off the carpet, and then the lino. 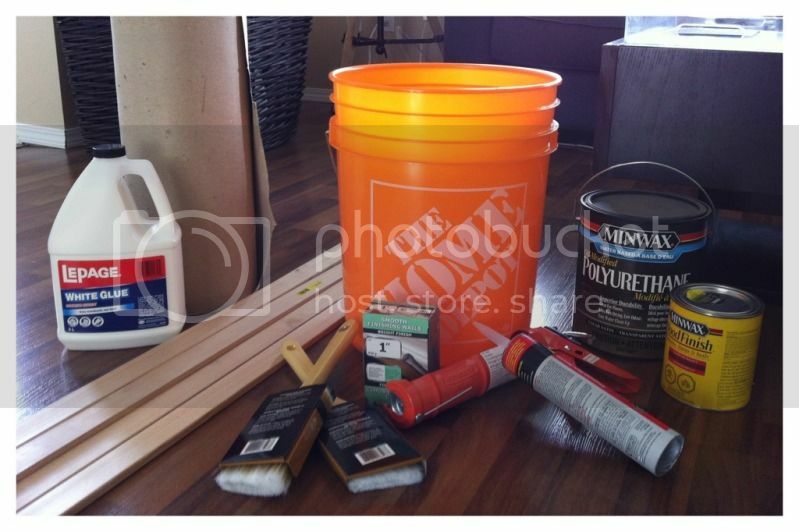 A gallon bucket, a roll of dry sheathing, a 3L jug of white glue, hemlock trim, two dollar store paintbrushes, a caulking gun, PL400 construction ashiesive, paintable caulk (not pictured), brown caulk (not pictured), 1" smooth finishing nails, a roll of paintable wall liner (not pictured), a can of MinWax wood stain in Special Walnut, and a can of MinWax Oil-Modified Waterbased Polyurethane in Satin. That's it- that's ALL we used on the stairs except for paint. And baseboard, but that was another project. As you can clearly see- the top tread in that picture has yet to receive it's new face, and the bottom one had the trim applied. 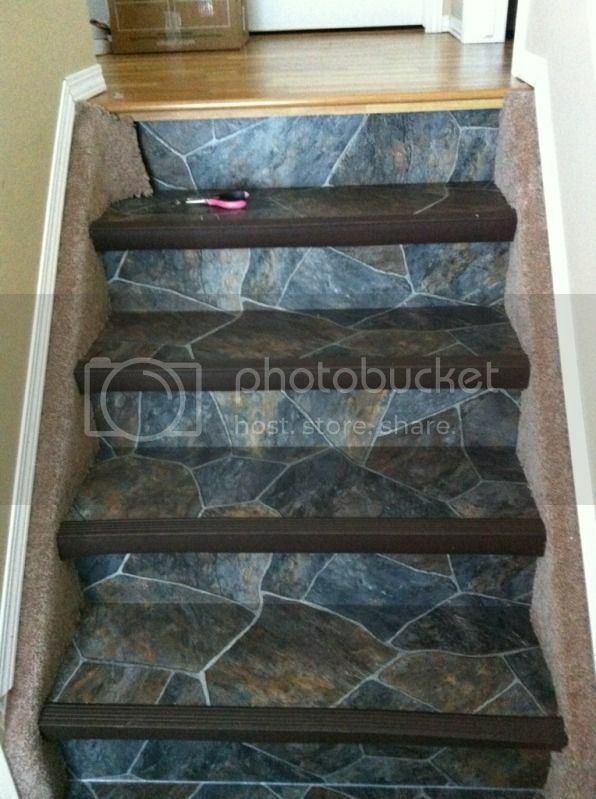 It made such a difference in the look of the stairs already, covering those nasty edges. 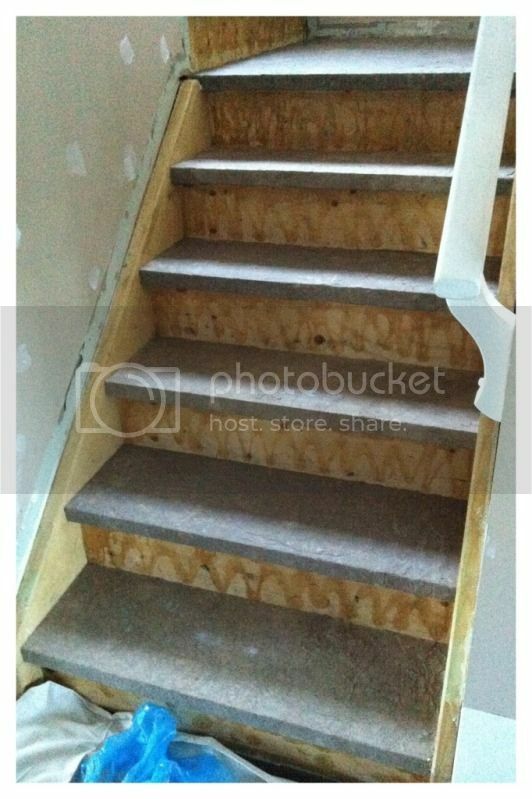 Having now finished the stairs I can confidently say that I am extremely glad we didn't skip this step! 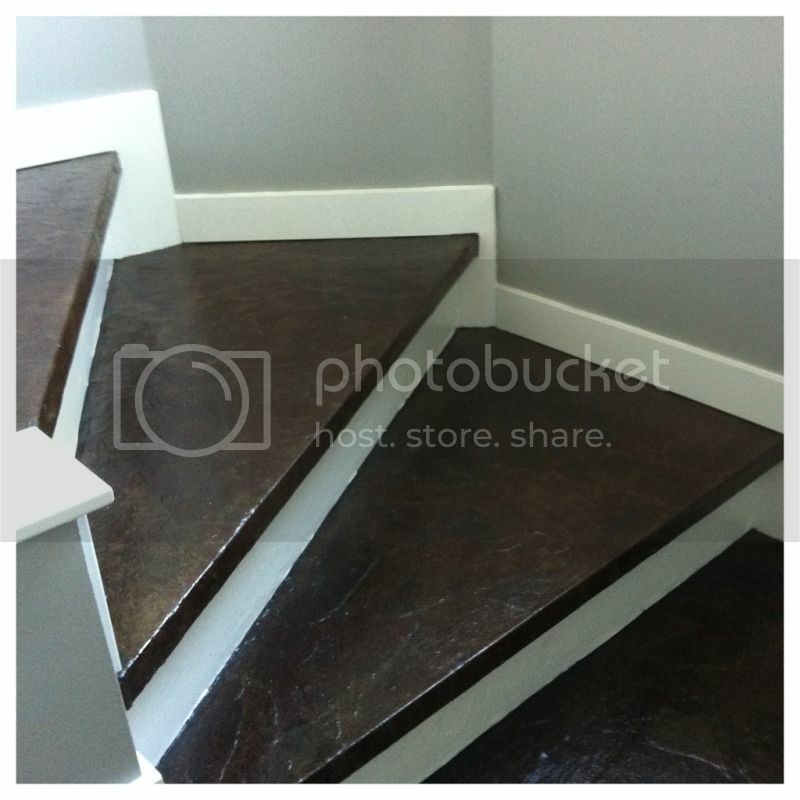 Our stairs have such a nice clean profile to them because of that trim- the whole look would be ruined without it. Next it was on to applying the paper. This wasn't difficult, although hindsight is 20/20 and having done it once if I were to do it again I'd take a lot more care in applying the paper. Just make sure there's no holes, it's well adhered to the tread, and it's as smooth as you can get it. 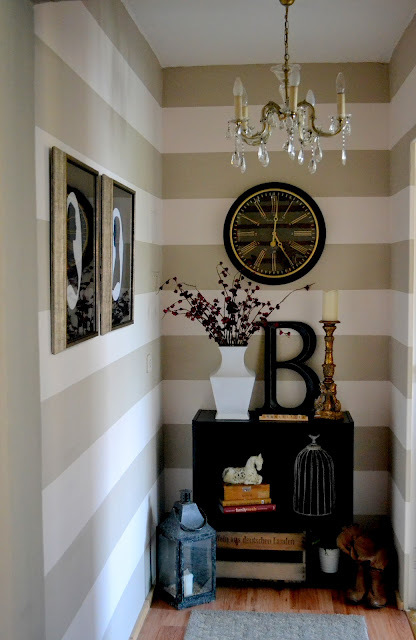 We followed the basic instructions given by Rachael of Lovely Crafty Home. All this step required was to rip the dry sheathing into chunks the night before (really helpful on stairs where you don't want to be hauling a big bolt of paper up and down), and to mix a 3 to 1 solution of water to white glue in the big bucket. Ah. I can't tell you the relief I felt when the paper was down and looked good!! So happy!! At this point we took a break from the stairs to paint the walls. The paper held up incredibly well to this, but we did end up tearing it in a few places. We went wrong in our attempt to fix these spots- what we should have done (again with the 20/20 hindsight!) was stain stairs first, including the areas where the paper was curling up, and THEN glued them back down. However we didn't- we tried to glue them down first with straight glue. Which resulted in the stain not adhering to the patches. 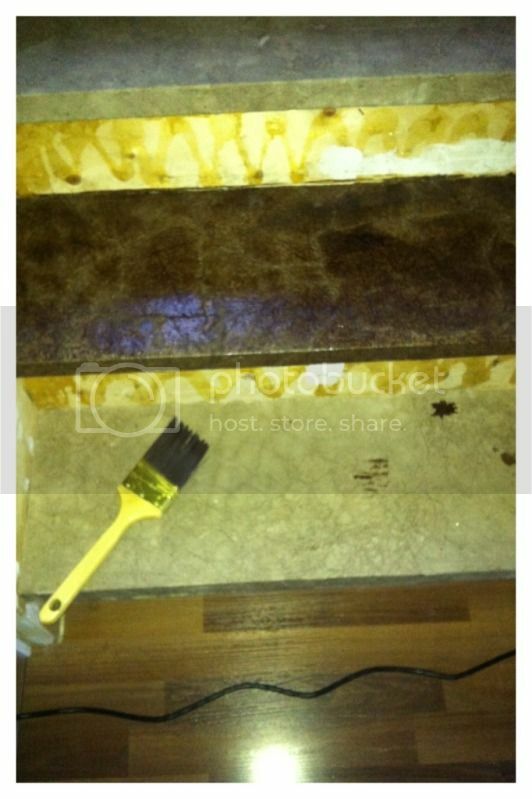 Applying the stain was easy- we used one of the dollar store brushes we'd used for the glueing to swirl the stain on. Remember- this isn't wood. There's no grain. So a circular motion seemed to give us the best coverage and colour distribution. The Lovely Crafty Home guide states that the stain never really absorbs into the paper, however I think we used a different paper than she did- our stain dried. We ended up putting two coats on our paper to get the depth of colour we wanted. Once dry we decided to camouflage the areas that weren't accepting stain by stippling on some Raw Umber Folkart acrylic paint (procured from Michaels). At first I was really worried- it seemed incredibly obvious to me. However once it'd dried it was already blending together well, and the poly removed the only thing you could notice: the different sheen. Poly was the final step for the treads! 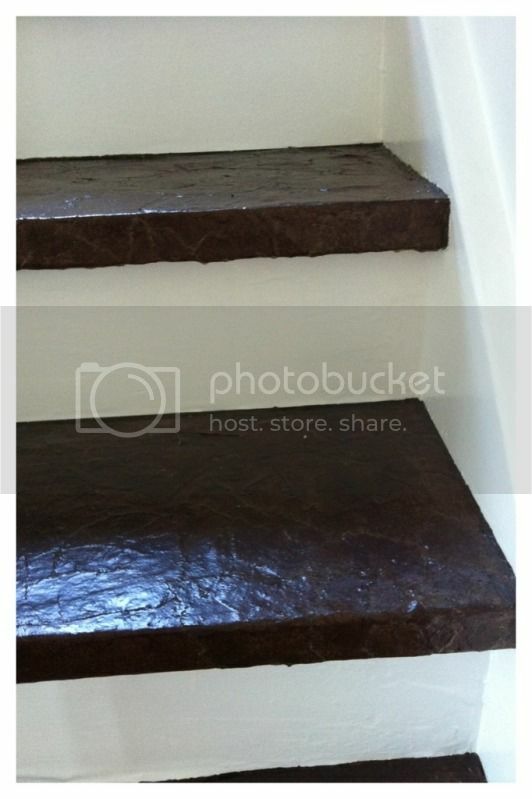 So simple a child could do it- simply stir up the poly, and paint a thin coat on the treads and around the nosings. 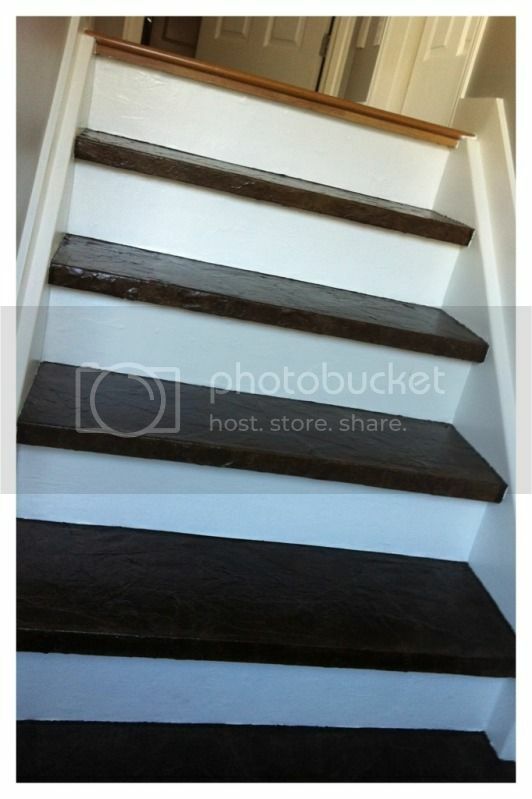 Once again working every second stair if you need to get up or down them, however the MinWax Oil-Modified Waterbased Poly we used has a drying time of 2 hours- and they really are completely dry once that's up. 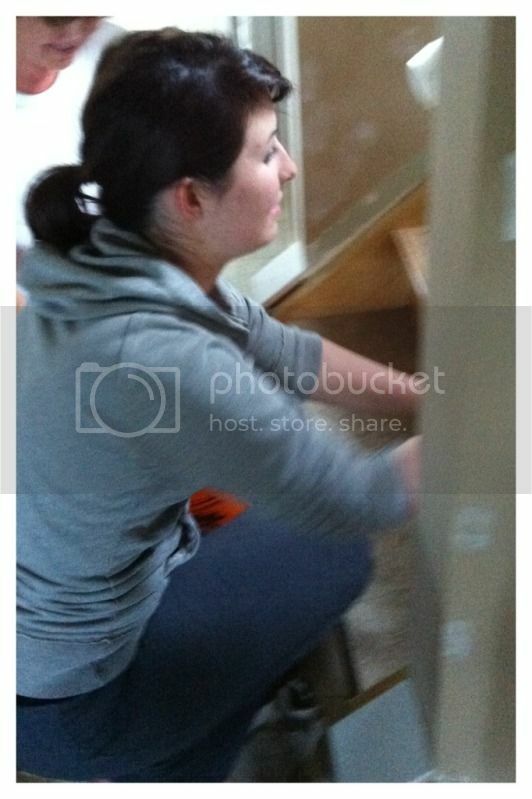 So if you can lock yourself out of your upper floor for two hours, save the time and poly every stair! We did 3 coats before starting in on painting the stringers, risers, and installing the baseboards- but I'm slowly working up to putting 12 coats of poly on in total. At the time of writing this, I'm halfway there at 6. Paintable flat wallpaper! 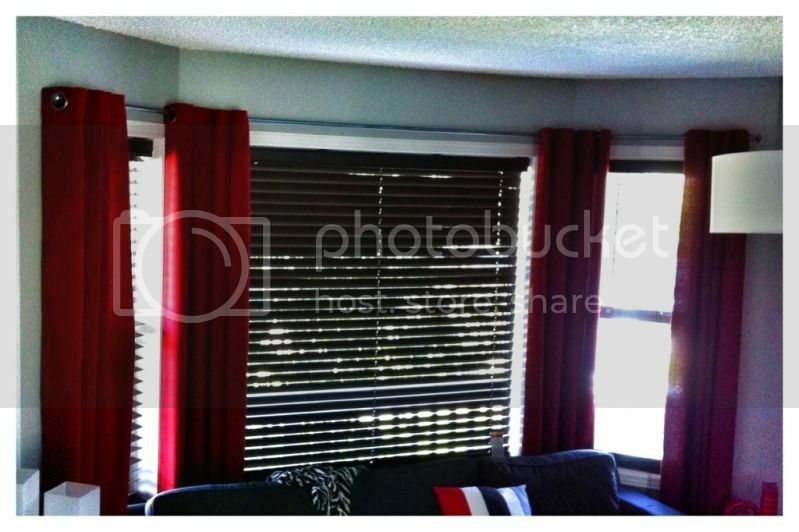 At just under eighteen dollars a roll it was by far the cheapest option, with the easiest instal. 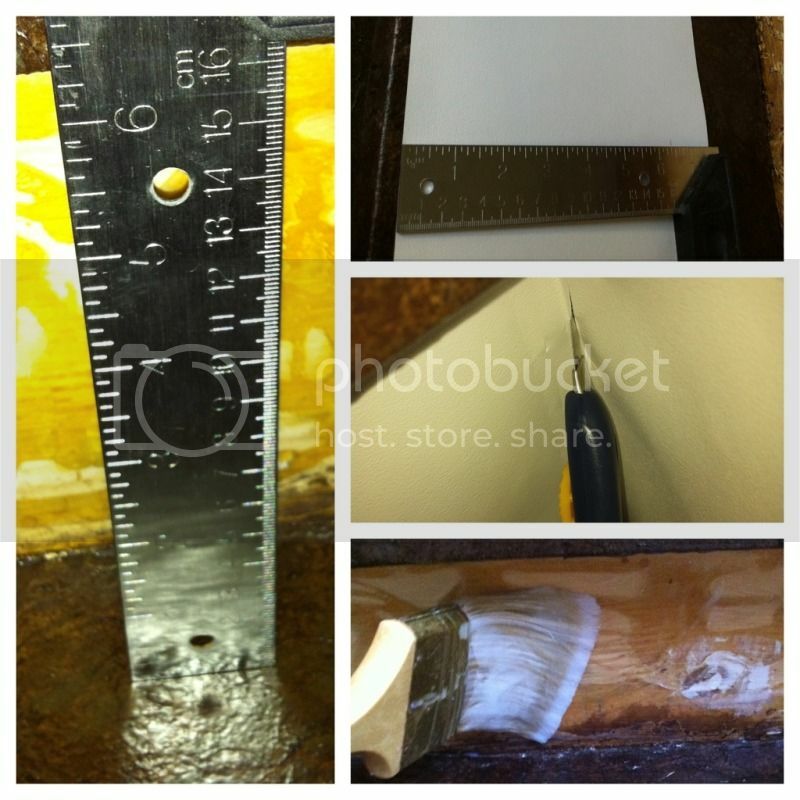 I simply measured the height of the riser, cut an overly long length of paper, measured the height on to it, cut it out, dry fit it, and then used wallpaper adhesive to glue it in tight. The excess length I trimmed using an xacto knife. Once that had dried I was still left with a bit of a gap between the paper and the stringers (one can only get so precise when freehanding with an xacto knife!) so I turned to my old buddy paintable caulk and filled the gap before painting the paper and the stringers in Kilz Pro-X untinted semi-gloss. On the left you can see the gap left between the primed stringer and the wallpaper, and on the right you can see how nicely the paintable caulk hides my mess! 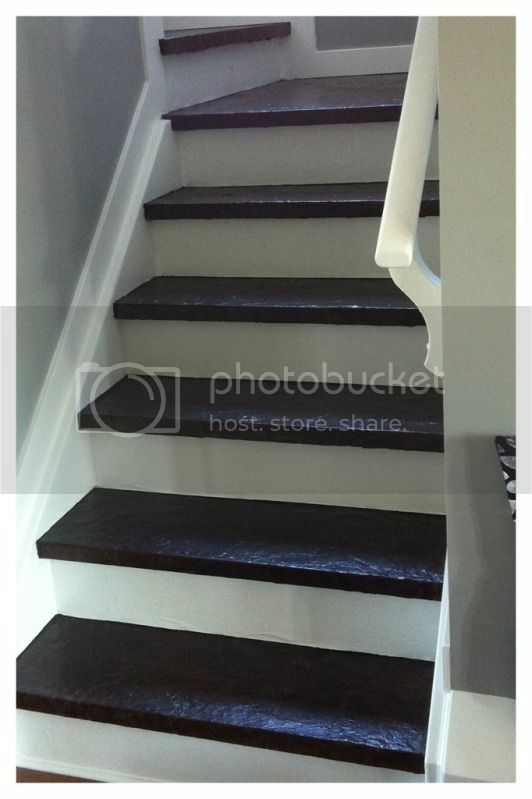 So once all the extraneous elements were painted out in matching white, all that was left was the afore-mentioned gap between the papered treads and the stringers and risers. Remember how I said I wish we'd taken a bit more care when putting down the paper? This is why. See the top? We couldn't get a clean edge while painting because we weren't careful about putting straight edge pieces tight against the stringers and risers. We fixed it by taping off the painted areas and using exterior brown caulking to fill it in. CAREFUL! 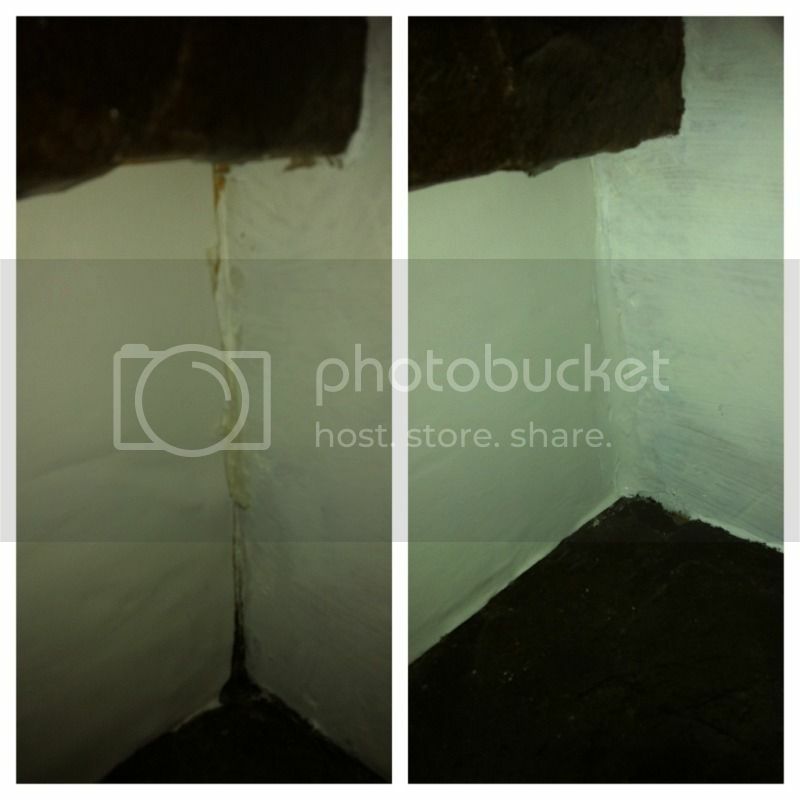 Exterior caulk is not water-based, nor is it water clean up. I ended up having to run to Home Depot to get some special cleaner to get this stuff off my Mom's hands. It also helped to tap the still-damp caulk into place when it pulled away with the tap a tad. Again- I was really worried about how obvious it seemed until I waited for it to be dry and lightly sanded each tread with ultra fine grit sandpaper and then applied another coat of poly. It's amazing how everything blends together when it has the same sheen to it! Pretty big improvement- don't you think?! Everyone whose walked into the house since the update has been floored (pun completely intended!) by the transformation. And for a little over 200$ and a can of paint? Not half bad if I do say so myself! I hope I've inspired you to try a creative solution to something in your house that's bugging you. And if anyone has any questions about the process or wants more information- please don't hesitate to ask in the comments! I'm more than willing to help!